Prizmo is a straightforward, powerful, and versatile scanner for Mac. Its Optical Character Recognition (OCR) features allow the app to convert photographs or scans of text into readable, usable text files with just a click. Equally compatible with scanned pages, images from the web, or even photos taken on your Apple devices, Prizmo OCR Mac scanner is the simplest way to convert physical text, old posters, and anything else that strikes your fancy into high-quality, searchable PDFs. Fluent in 23 languages and capable of processing multiple pages at once, Prizmo is ready for any book, magazine, poster, or brochure you throw at it. This compact Mac scanning app comes packed with tools to help make your life easier. Whether you need to bump up the resolution on an image, eliminate the distortion of a bent page, or correct for perspective, the app has you covered. Its text-to-speech feature can even read to you. Save yourself the sweat and leave it to the professional scanner app for Mac that allows you to copy text from any picture. Here’s how to get the most out of it. As an OCR scanner app, Prizmo can edit and perform OCR on images from a variety of sources, including scanners, cameras, and your hard drive. Click the + icon and select your source from the drop-down menu. Highlight the image or images you’d like to work with and click “add” — they’ll appear in order along the left-hand side of the app window. If the language isn’t automatically detected, click the globe icon to select it. 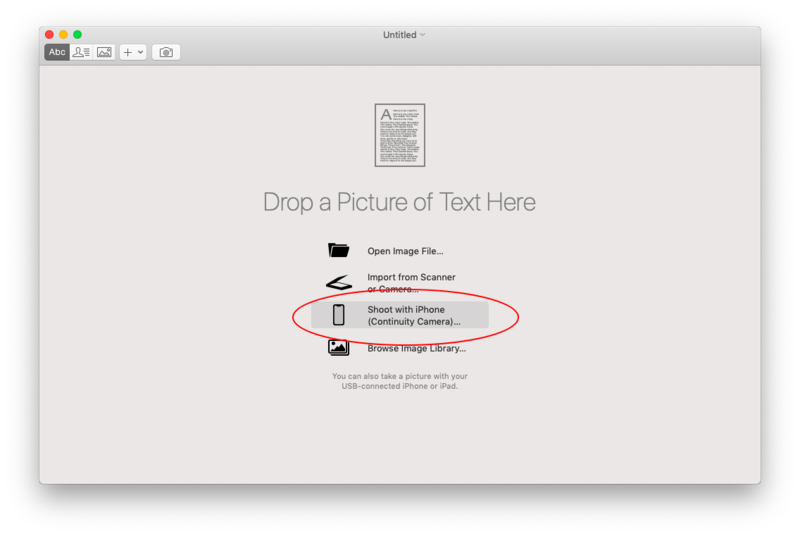 Or, there's an even easier way if you have your documents at hand: import them directly through iPhone's camera. To do this, select Shoot with iPhone from the sources on the main import menu. You'll see your iPhone's name after, simply select it and close the window. Now, any image you make with a phone will be directly imported to Prizmo and you'll see it immediately. The app’s toolbar gives you a range of options for preparing your image for OCR. Select Frame and highlight the grid icon to adjust the corners of your image and eliminate any distortion to the text from perspective. A more complex version of this technique, under the Curvature tab, can even correct for bent pages. The sliders under the Adjust button help make the text more readable by increasing sharpness and contrast. Click Recognize to start the OCR process. When the process is finished, you can review the extracted text on the right-hand side of the screen and correct any formatting errors or misrecognized characters. The recognized text can be translated, read using Text-to-speech technology, or shared. Click the Speech button to hear the text read aloud or convert it to another language with the Translate menu. Click the share button to distribute your document. You can use the drop-down menu to choose between file types that use the plain text you extracted, a PDF of the original, or a searchable PDF that combines both. When you’ve chosen your file type, pick your export method of choice from the dropdown menu or click Export to File to save it to your Mac.